Rally Off-Island | From the Seasonally Occupied Territories . . .
Travvy’s fans have reminded me that I haven’t written much about him lately. They’re right. I’ve written a fair amount about dogs who kill chickens (and the humans who let them down) and dog policy on Lambert’s Cove Beach, but I haven’t written much about Travvy. This one’s for him. Trav and I finished our CRO Level 2 title on April 15. Here’s the boy with his spiffy new title ribbon. This past weekend we went up to Westford, Mass. (just this side of Lowell — almost all the way to New Hampshire), for our first APDT Rally trial of 2012. For a brief description of Rally — aka Rally Obedience, or Rally-O — see “Rally at the Tennis Court.” Over the winter we’ve been honing our old skills, developing new ones, and advancing in Cyber Rally-O (CRO). CRO offers training challenges a-plenty, but you don’t have to go anywhere: you video your run and upload it to YouTube, where the judge studies it carefully then tells you if you’ve Qed (qualified) or not. With APDT (that stands for the sponsoring organization, the Association of Pet Dog Trainers) Rally, the challenges begin long before you and your partner enter the ring. Ferry reservations. Motel reservations. Packing the car. Highway driving. Finding first the motel and then the venue where the trial is being held. I still navigate the old way, with maps and printed directions, but I’d been to both places before so this wasn’t a hassle. Navigate is what you do with a Rally course. 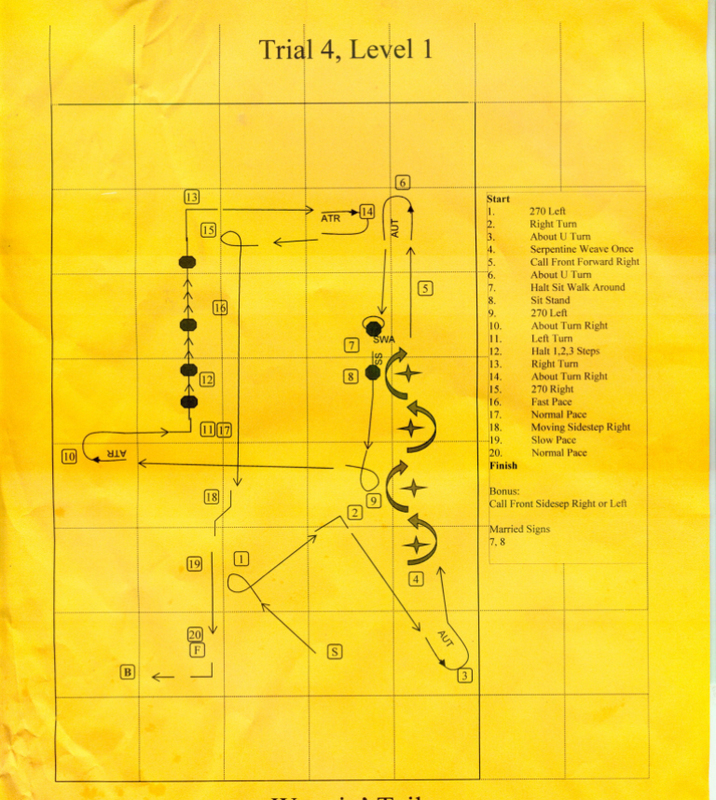 A typical APDT Rally course comprises 18 to 20 signs, each requiring the team to perform a particular exercise. The signs are numbered, and have to be performed in the correct order. No GPS devices are allowed, and most dogs don’t count sign reading among their skills, so the handler has to focus on the numbers, the signs, and the correct execution of the exercise, all the while being excruciatingly aware of her canine partner’s mental state. At a trial the distractions are many: other dogs, people, an unfamiliar setting, the general level of stress and excitement. Our haul from last weekend: 6 Qs, 5 placements, 1 perfect score. Over the weekend, Trav and I entered four Level 1 classes and four Level 2. In Level 1, the dog is on-leash. The leash is supposed to hang loose, and you lose points whenever it gets tight, but the leash is there. When you get to Level 2, you realize what a difference this makes. Level 2 is off-leash, and some of the exercises require the handler to move some distance from the dog. Trav is easily distracted, and he’s only fair-to-middling on the impulse control scale. 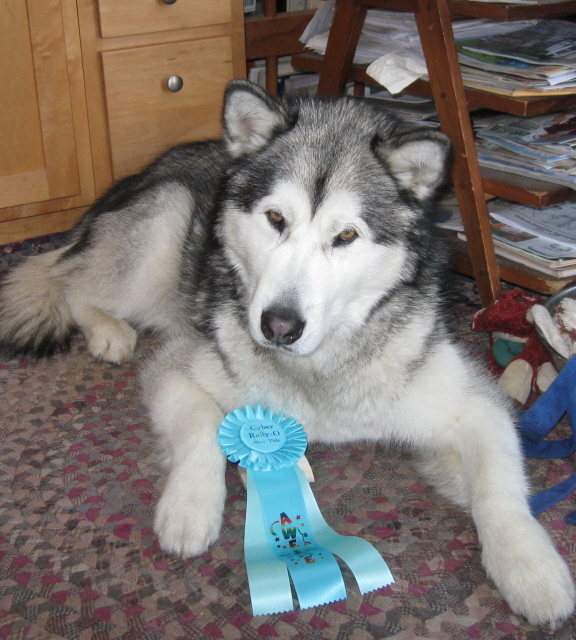 He’s also an Alaskan malamute, which is no one’s idea of the ideal breed to do obedience with. When the leash comes off, my stress level goes up. No surprise then that we Qed in all our Level 1 runs, all with very respectable scores (including a 210 — perfect score!) but only two of our Level 2s. One of the NQs was due to Idiot Handler Error — I missed a sign. The other — well, APDT Rally includes an exercise, the off-set figure 8, that requires the dog to heel, off-leash, a figure 8 among four food bowls that have (dry) dog food in them. Trav’s prey drive is high, his impulse control low, and he’s also a resource guarder. This means he’ll usually growl when I try to take something away from him, and in high-stress situations he may snarl or even snap. The latter can get you thrown out of Rally for good. The risk isn’t worth it. The Dreaded Food Bowls showed up in our last Level 2 course. I asked the judge if we could take an NQ and do the course on-leash as a training run. She said yes. As soon as Trav realized the food bowls were there, it was clear that the leash was the only thing preventing him from making a beeline for them. The judge, watching, said, “You know your dog.” That I do. Below you’ll find two fairly typical Rally courses, one for Level 1, one for Level 2. The names of the exercises are at right. The crosses in exercise #4 represent cones: the team weaves through them without knocking any of them over. In exercise #12, the one on the left that looks like a spindly tree, the team halts, then takes one step forward, then two steps forward, then three steps forward, with the dog sitting at each halt. Before each class, the handlers get to walk the course without their dogs. This looks pretty funny from outside the ring, because most of us walk with “air dogs” on our left, trying to gauge how much room we need to allow for each maneuver. The object on the right (exercise #5) that looks like either a dirty Q-tip or a skinny barbell is a jump. There are jumps in Level 2 and Level 3. 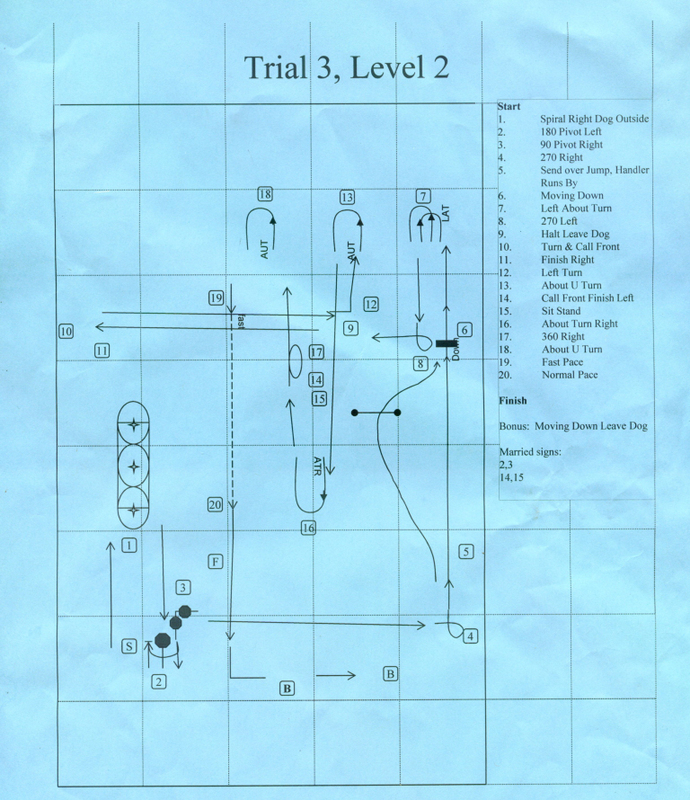 The crosses on the left are, once again, cones, this time arranged for “spiral right, dog outside” (exercise #1). We call this the paper clip because that’s what the pattern looks like: first you heel around all three cones, then you heel around the first two, then you heel around the first one. Dog training is fascinating and challenging in all the best ways, and I thank Travvy for introducing me to it and Rally-O. 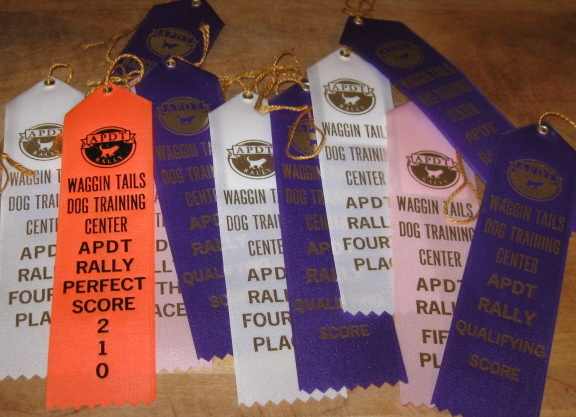 This entry was posted in dogs and tagged dog training, dogs, Rally, Travvy. Bookmark the permalink. Highly informative and entertaining. I was trying to picture my little dog, Grover, going through a course like this. The very idea provokes amusement. You’ve done wonders with Trav. I’ve just today discovered your blog, and you’ve enriched my day. I’m a summer resident of Aquinnah, thus, I guess, part of the occupying forces. How big is Grover? I’ve seen dogs of all sizes doing Rally, from Pomeranians to Newfoundlands and Great Danes. Jump heights are set according to the size of the dog and can be adapted for dogs with disabilities or other limitations. I tell people that doing tight turns and circles with a dog Travvy’s size is like steering the QE2. Thanks for the welcome back. At some point, if the planets align properly, I’ll be able to be here for more than just the summers. Grover is 12 pounds, a bichon-miniature poodle mix. He has a big-dog attitude and would probably love competition. We are a therapy team back home, visiting hospitals and nursing homes, and I sometimes get the feeling he’s a bit bored by all the fawning. Is there any sort of Rally or agility course program here on the island? Karen Ogden (Positive Rewards Dog Training) in Vineyard Haven teaches both, as well as basic obedience, scent work, etc., and is very good. I’m not sure if she has intro agility or Rally classes starting this summer. Her website is http://www.positive-rewards.com/. My Travvy seems to like the mental challenge, though obedience is not in his natural repertoire. It’s a mental challenge for me too! I think you are going to have to put up a storage shed for all of Travvy’s ribbons! Good dog, Trav. Nice description–I got it. I’m hoping age will help with Trav’s food aggression. With my dogs, trading has really taken the edges off that. If I take something, I trade a treat for it and the dog trades voluntarily. Also, wen they were pups, I would approach while they were eating, and add food to their bowls. We do a lot of trading. Also “leave it” practice and click & treating whenever he voluntarily looks away from something he wants, like one of the squeakies the neighborhood dogs steal from each other and leave in our yard. I can take his food away from him and give it back, no growling. The catch is that in high-stress situations, instinct generally trumps training, and Trav is most tempted by new things: if he’s seen a toy twice, he’s not very interested in it, and if he’s walked by a food bowl with food in it, ditto. But trials are by definition high-stress, he’s never seen these food bowls before, and the margin for error is not much. For now I’m going to keep playing it safe — I’d rather NQ than get thrown out of the game. The town needs an OCO (Owner Control Officer) to work with the ACO. Follow up on “owners” after first incident, spend several weekends as you do. Test at the end, NQ, no dogs! As an afterthought, imagine them having children. Yeah, that’s pretty scary! I would seriously like to see more work done with the owners of dogs that are on the verge of getting into trouble. Maybe a buddy system, or something like Big Brothers/Big Sisters? or AA? OTOH, “sentencing” someone to do training is sort of like the courts ordering drunk drivers to attend AA meetings: if you aren’t going to work at it, it’s not going to work. So I just put it out there that if anyone is thinking of getting a northern breed dog (Alaskan malamute, Siberian husky, Akita, etc. ), or is having trouble with one they’ve already got, I’m willing to help. I don’t know much, but I know more than most people who are in over their heads.